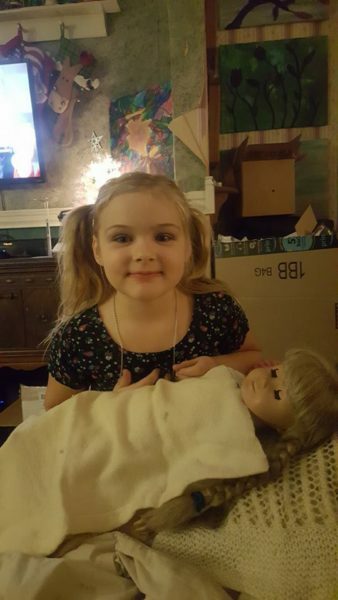 About a month ago, I was thinking of my American Girl doll, Kirsten, and how much she meant to me back when I was 12 and the catalog was first being circulated. 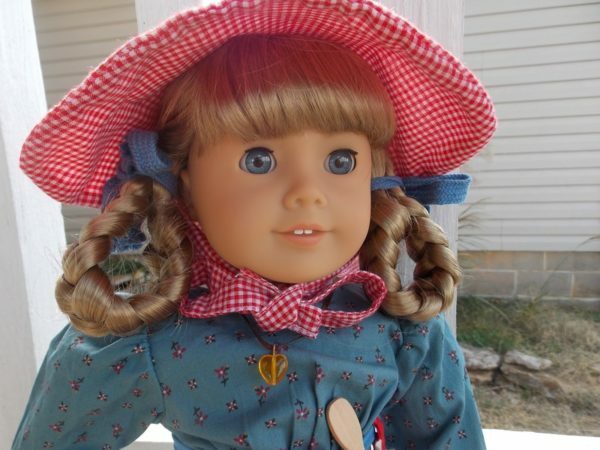 I fell in love with Kirsten, the AG doll immigrant who moved to Minnesota in the 1800s. I saved all my babysitting money for ages and bought her. I was hopelessly in love with her from the start. I went on to buy her accessories and clothes, and she had her own "home" in the corner of my room for years. She was my treasure, and I loved her. But times change, and people grow up. And before you know it, I was an adult, and Kirsten gathered dust in my old bedroom in my parents' home. Now I'm 40, and Kirsten, though still one of my most loved possessions, needed a new home. But what should I do? American Girl dolls are now very common, and I know girls who have several, now in their modern clothes with modern accessories, a far cry from my Kirsten and her old fashioned dresses and hair bows. Who on earth would love my doll the way I do? I put the call out on Facebook. Who knew of a girl who would treasure Kirsten the way she deserved to be loved? Almost immediately, my friend Jo responded, telling me that her daughter Harper was the best friend that Kirsten needed. The plot was afoot. Jo and I planned to get Kirsten to Harper for days. I would pack Kirsten up, with her wooden table and chairs, her trunk with all her treasures, and send her to Harper. I was practically vibrating with excitement. Harper was going to get my treasure for Christmas, and this was the gift that I was not only the most excited to give, but this was also a gift I would receive. I don't have children of my own, and making Harper happy was a gift that could not be wrapped. This was going to be my Christmas miracle. Off Kirsten went, and stayed under Jo and Harper's tree for a week prior to Christmas. Harper knew that the enormous boxes were for her, but nothing else. She was so excited, and a little scared, because she had no clue as to what could be inside. Jo and I kept in close contact, mentally hugging each other and jumping up and down in excitement. We were as excited for Christmas morning as Harper was. And then it happened. To say Harper was excited and joyous would be an understatement. She tried her best, but 10 minutes after opening the box and finding Kirsten inside, she burst into tears. She was so happy that she wept over my doll, my Kirsten, who was now hers forever. Jo sent me video and pictures, and I got teary as well. This Christmas was perfect. Later that day, after Harper had changed Kirsten's clothes five times and put her down for a long winter's nap, she told her mother "Kirsten means everything to me. Tell Danielle I love her." And that's the best Christmas present I could have ever gotten. I love you too, Harper.